JAKARTA (foresthints.news) - It has been proven that the supply chains of the world’s largest palm oil trader, Wilmar International, remain linked to new peat development after the disclosure by the Indonesian government of peat violations in forested peatlands committed by one of its major suppliers. Last week’s ground inspection by the Indonesian Ministry of the Environment and Forestry - as reported by foresthints.news (Jul 18) - revealed how the operations of PT AGL, one of the palm oil companies under the control of the Ciliandry Angky Abadi (CAA) group, have involved extensive clearing of forested peatlands. 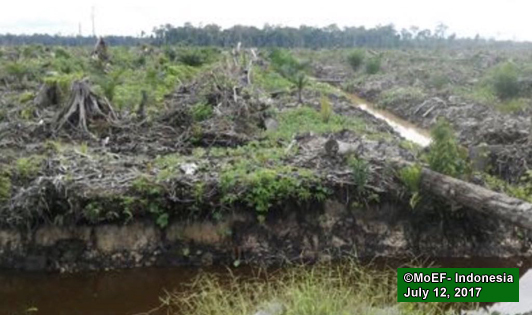 In fact, the draining of these forested peatlands has been taking place in Central Kalimantan’s Pulang Pisau regency, designated as a peat restoration priority regency. 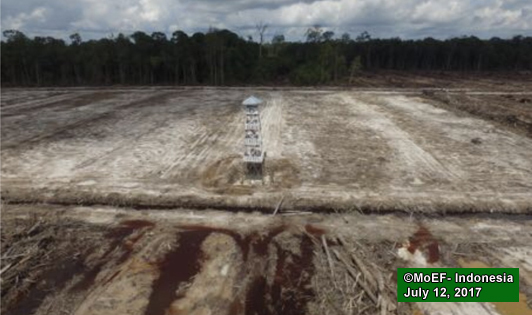 Even more alarmingly, the forested peatlands cleared by the CAA palm oil company include the habitat of the critically endangered Bornean orangutan. The CAA group forms part of Wilmar’s supply chains. These actions contravene the ban on new peat development by forestry and palm oil companies put in place by Environment and Forestry Minister Siti Nurbaya in early November 2015 on the order of President Joko Widodo. 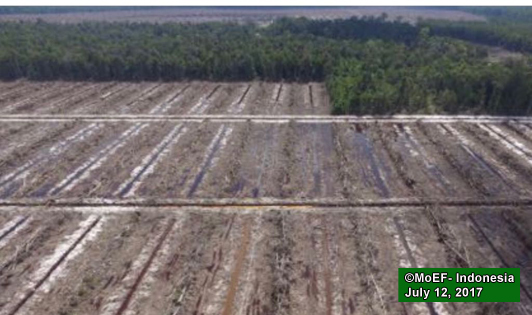 The following photos demonstrate the clearing of forested peatlands carried out by the CAA palm oil company in April 2016, as was acknowledged to the ministry’s inspection team. This finding represents a clear breach of the minister’s ban. In early December 2016, President Joko Widodo signed a newly-revised government regulation on peat protection and management, effectively prohibiting any new peat development including practices such as the clearing of peatlands and construction of new canals. 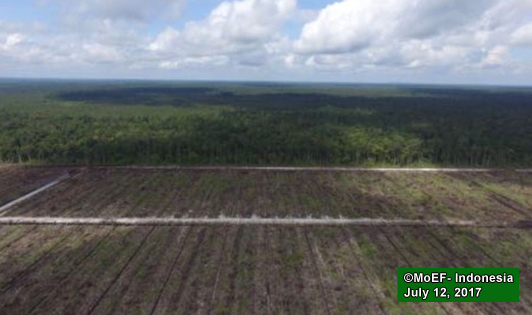 Nonetheless, it seems that the President’s signature has not been enough to stop the CAA palm oil company from continuing to clear forested peatlands in order to develop its new palm oil plantation. 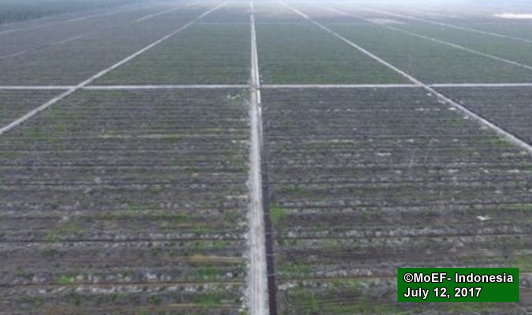 The following photos show peat violations perpetrated by the company during May and June 2017, a blatant transgression of the President’s newly-revised regulation, as was divulged in the ministry’s report. A request by foresthints.news for a comment from Wilmar (Jul 19) about the ministry’s exposure of peat violations which, it turns out, involve its supply chains did receive a reply although it could hardly be considered substantive. Wilmar’s spokesperson, Sharon Chong Choy, responded in writing (Jul 20) that the Singapore-based agribusiness group was still following up with the CAA group. She added that foresthints.news would be updated when more information becomes available. 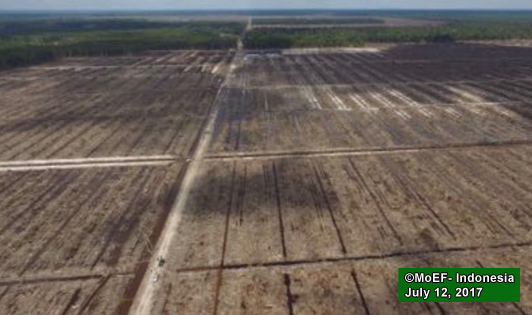 The ministry’s findings were in fact particularly detailed, revealing that the CAA palm oil concession - which obtained a permit from the previous government - has been clearing forested peatlands with a thickness of between 1-2 meters, as depicted in the following photos from the ministry. The results of the ministry’s ground inspection need to be seen in the context of government attempts to uncover all violations by the corporate sector of Indonesia’s peat regulations and as part of its law enforcement efforts in this regard. In the case of Wilmar, the ministry’s findings could be used by stakeholders to illustrate that the company’s supply chains remain linked to deforestation, new peat development, and the destruction of the Bornean orangutan’s habitat. Furthermore, the situation also reveals how Wilmar’s no peat exploitation policy, declared in early December 2013, has apparently not prevented parts of its supply chain from clearing forested peatlands which play host to the fast disappearing Bornean orangutan. That is, Wilmar's supply chains are continuously linked to contributing to increasing carbon emissions arising from peat drainage. 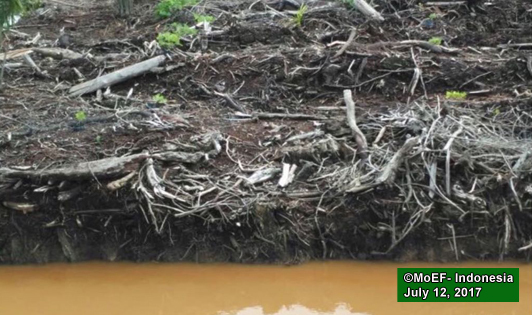 What's more, the extensive peat drainage which began last year in the CAA concession appears to have gone undetected by the Wilmar monitoring system.